8. What Are You Willing to Do? 10. What Kind of Enjoyment? 13. Where Do You Cry? This is the long awaited follow up to LOVE ONLINE. 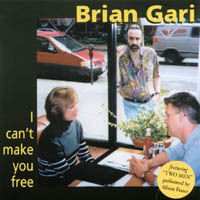 BILLBOARD MAGAZINE calls the album 'a tunefulness throughout'...Gari's songs don't envelop the listener in self-pity and at times offer memories of a more pleasant past. Vocalist Alison Fraser has a solo with touching sweetness on "Two Men." ALAN COLMES/Hannity & Colmes Fox News Channel. It is gratifying to see someone whose work you admire get better with each new release. Brian's haunting melodies and precicely-worded phrases stay with me long after even one listen to songs like "Limited Time" and "That Car." Like fine wine, Brian's music gets better with age, and each new work shows greater depth and more intriguing nuances. I hope that more people learn of his music and that he gains the recognition his music deserves. Celebrated drummer HAL BLAINE says "His love songs are still the greatest but they make me cry!"